Lausanne (SUI), 20 April 2010 – The FEI press conference, held on 17 April in Geneva, on the disqualification of the horse Sapphire ridden by McLain Ward (USA) in the FEI World Cup Jumping Final, is now available free-to-view on FEI TV in English. Visit www.feitv.org and register to watch for free. The opening statement by the FEI President is available here. 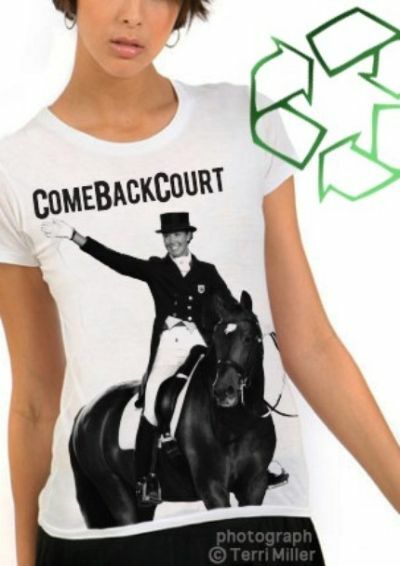 Geneva (SUI), 18 April 2010 – An urgent appeal/protest was lodged this morning by the United States Equestrian Federation (USEF), McLain Ward (Person Responsible) and Dr Tim Ober (USEF Team Veterinarian) against the disqualification of Sapphire from the FEI World Cup Final. 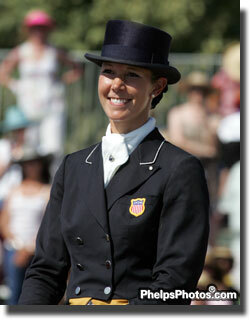 The FEI Tribunal heard the case for emergency relief to allow the horse to compete today. Following the hearing, the FEI Tribunal Chair Ken Lalo (ISR) denied the request for emergency relief on the grounds that the FEI Tribunal did not have jurisdiction to overturn the Ground Jury’s decision. This means that Sapphire remains disqualified from today’s final round of the FEI World Cup. Sapphire, the horse ridden by McLain Ward (USA), was eliminated from the second round of the FEI World Cup Final on Friday night (16 April) and disqualified from the rest of the event following a positive hypersensitivity test. 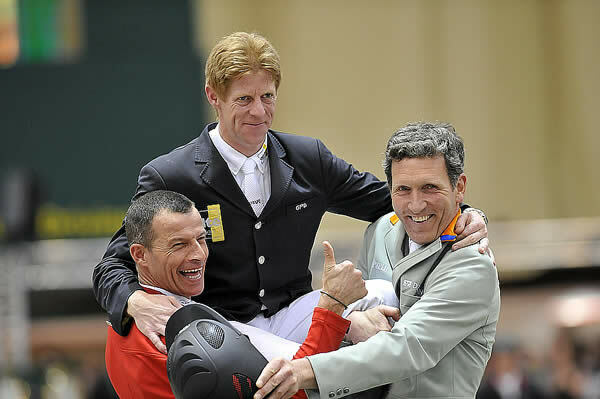 Runners-up Pius Schwizer of Switzerland (left) and Ludger Beerbaum of Germany (right) hold the newly-crowned 2010 Rolex FEI World Cup champion Marcus Ehning of Germany aloft after his victory in Geneva today. Photo: Kit Houghton. Germany dominated the winner’s podium when Ludger Beerbaum produced one of just four double-clear performances in today’s competition to finish joint-runner-up with Switzerland’s Pius Schwizer. And the thrilling class highlighted some great characters and new arrivals, but shattered the dream of America’s Mario Deslauriers who it seemed was about to re-take the title he first claimed 26 years ago in Gothenburg, only to see it slip from his grasp in the fading moments. Course designer Rolf Ludi presented two more classic tests, but only seven of the 29 starters got it right in the first round and when Deslauriers and his brilliant nine year old Dutch gelding Urico were amongst them it further bolstered their position at the top of the leaderboard after the first two legs. The flimsy planks at fence four, the vertical following a tight left-hand bend at seven and the water-tray oxer at fence 10, ridden on a three-stride distance from the previous 1.60m FEI vertical, proved the bogeys here but when Ehning’s Plot Blue clipped the very last – a wall with beautifully-carved Swiss cows decorating the top of it – then it seemed his chances were scuppered. With only four points separating the top four riders going into the final day every mistake was critical, but third-placed Schwizer lowered the bogey planks while fourth-placed Patrice Deleveau of France kicked out the oxer at fence two, so Ehning only slipped one place to third at the end of the opening round of jumping.